My dear friend, Diane, at The Dew Drop Inn has a very special tradition. On New Year's Eve, she creates a magical bag full of important words written on small cards, words that come from the very depths of spirit and inspiration. She invites everyone and anyone to draw a word from the bag. The word is then yours to ponder, reflect, or just giggle at and toss aside. I was thrilled to partake in this tradition again this year. I reached in and rummaged through the cards until my fingers found the small word meant for me. I read it, smiled, and let it ooze into my soul. 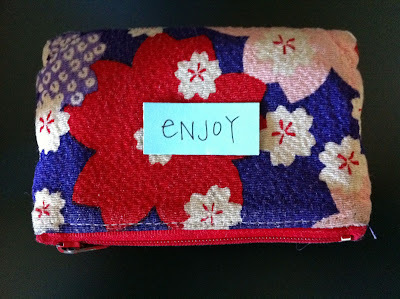 I tucked it into my little black purse as we all headed out to a bacchanalian evening of dance, costumes, and art. How thrilled I was to find this word on August 3rd! (Or to have it find me again.) And the timing couldn't have been more synchronistic, seeing as I was on VACATION. It's funny, but being tied to crutches for the past few months has really been one of the greatest gifts. I have slowed down in ways I don't think I would've just because I wanted to. I've said no to extra obligations that have been asked of me. I've taken naps when my body was tired. I've allowed myself to move through the world slowly, watching, enjoying each step of renewed strength. Recently I heard someone describe the joy they got from smoking a morning cigarette. It wasn't the actual cancer stick they craved, it was the quiet moment on the back deck overlooking the garden with nothing but their thoughts and a bit of sunshine. How sad, I thought, that we don't allow ourselves this morning ritual without a reason. What if we insisted on a few moments to ourselves each day where we could stop, take notice, breathe...enjoy? I'm as guilty as the next, getting caught up in the swirl of life. But having this word and these memories is encouraging me to keep that sacred time, especially now that the new school year is ready to ramp up at full speed. Morning Meditation is written in pen on my daily schedule, as well as permission to say no, and a reminder to take things slowly whenever needed. I give you all permission to do the same! What do you do to cultivate true Enjoyment in your life?